Carol Mackenzie Gale B.A. (Hons) M.A. 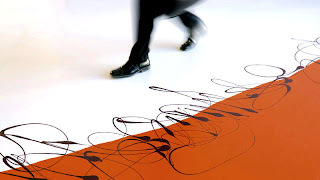 : Jeanet Honig - From painted canvas to painted floors. 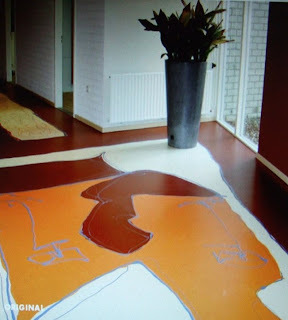 Jeanet Honig - From painted canvas to painted floors. Jeanet Honig, a German painter living in Zurich, Switzerland stepped 'out of her box' and I love that. Feeling restricted by the size of her large painted canvases, she began creating furniture and doors and finally finding expression in huge pieces of floor art. 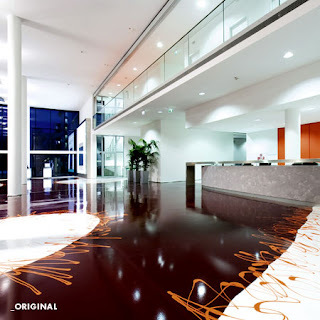 She discovered polypropylene, used for creating industrial floors, amazed that although a huge palette of colours was available, no one had thought of mixing them together to create interesting floor design. 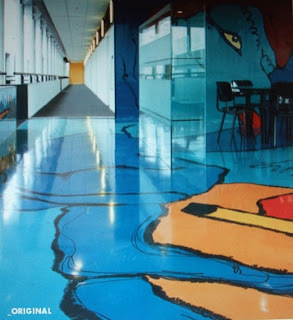 She was able to 'paint' huge areas with her individual and colourful designs to create unique floors. 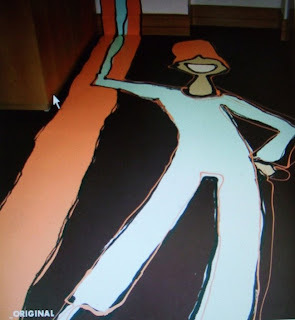 Some of her floor art covers 6,000 sq. m. She must work fast as the polypropylene sets quickly and there is no room for error. 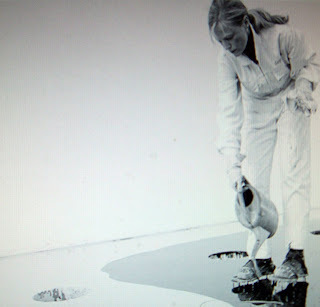 Wearing spiked shoes, the large areas are scraped into pre drawn shapes with large wooden spatulas and 'edging' is poured from a watering can. Inspired by urban life, she uses minimalist shapes and bold colour. 'combining art and function'. To my knowledge, Jeanet has created a unique way of working, creating art which everyone can enjoy and she creates each project herself. I can see a link with my own dilemma. I have been obsessed with my love of working on the square, enjoying geometric designs which change with the drape and movement of silk. Working with the division of space within a boundary, I create simple shapes using a combination of 'free' screens and painting. These 'scarves' are my paintings. If it were a painting on canvas, I could price it at any price the market would stand, but as a scarf, there is an upper price limit. Creating 'one offs' is so time consuming that I know I cannot make a profit unless I value that piece at a price which takes into consideration the length of time it has taken to make. Such is the dichotomy - art or craft or design? Is Jeanet's work art or design?. It is both, and she has found a way of expressing her art through a new medium finding a way to make here work both desirable and commercial. Enjoying your blog Carol. Very informative- good for you!